CBS has announced that their cancelled TV show, Living Biblically, is returning to Monday nights — at least for a little while. While there won’t be a second season, fans of the comedy will get to see the remaining episodes. *Updates below. 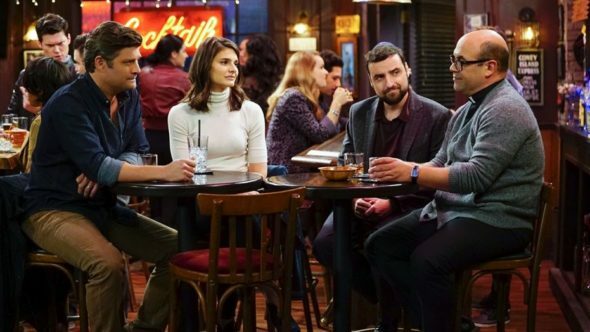 A fictional CBS sitcom inspired by a real-life venture, Living Biblically stars Jay R. Ferguson, Lindsey Kraft, Ian Gomez, David Krumholtz, Tony Rock, and Camryn Manheim. The sitcom centers on Chip Curry (Ferguson), a film critic for an NYC newspaper. After the death of his best friend, Chip decides to live a better life, through strict adherence to biblical precepts. Fortunately, he has the support of his good-humored allies: wife Leslie (Kraft); the “God Squad” (Gomez and Krumholtz); and his colleagues (Manheim and Rock). As he sets out on his journey, Chip wonders if the results will be of biblical proportions. The sitcom was cancelled and pulled from the schedule last month after eight episodes of poor ratings. Right now, it looks like the 13th episode (the series finale) will air on June 25th. Here’s information about the next couple episodes from CBS. “Never Let Loyalty Leave You” – Father Gene is jealous when he finds out that Chip attended Vince’s Baptist church to see another side of religion, on LIVING BIBLICALLY, Monday, May 28 (9:30-10:00 PM, ET/PT) on the CBS Television Network. Loretta Devine guest stars as Vince’s Aunt Estelle. “Submit to Thy Husband” – When Chip suggests that Leslie quit her job to stay home when the baby is born, she assumes it’s his attempt to get her to submit to him based on a bible verse, on LIVING BIBLICALLY, Monday, April 30 June 4 (9:30-10:00 PM, ET/PT) on the CBS Television Network. Loretta Devine guest stars as Vince’s Aunt Estelle. What do you think? Do you like the Living Biblically TV show? Will you be watching the remaining episodes of this cancelled comedy series? *5/28/18 update: CBS has delayed the return of Living Biblically for another week. It’s now set to return on June 4th. *6/4/2018 update: CBS will not air the rest of Living Biblically season one. Details here. Very few sitcoms featuring Catholic I like, most are so bizarre about the faith. I thought this was a cute show, and I DVRed while I was a hockey games. They even had a lot of the special interest groups represented and it didn’t seem forced like other sitcoms on CBS. I’m disappointed this show was cancelled. The show has a more moral position than most sitcoms. I love this show, original, funny and uplifting…what a nice change of pace! An original plot to a sitcom cancelled,.what a shame,. A funny show with a moral message done lighthearttedly cancelled,.WHAT A SHAME,I liked it. Religious comedy is in poor taste, regardless of which religion is disrespected. I’m glad it was cancelled. I think Living Biblically is VERY funny !!! I loved the show. It was funny, dealt with real situations, and the people came across as very real. Any word on if CBS will ever air the remaining episodes of Me, Myself, And I? That’s the show I’d love to see the rest of. I’d rather have “9JKL” back for season 2. Terribly unfunny show. And, it was awkward. No one wanted this.